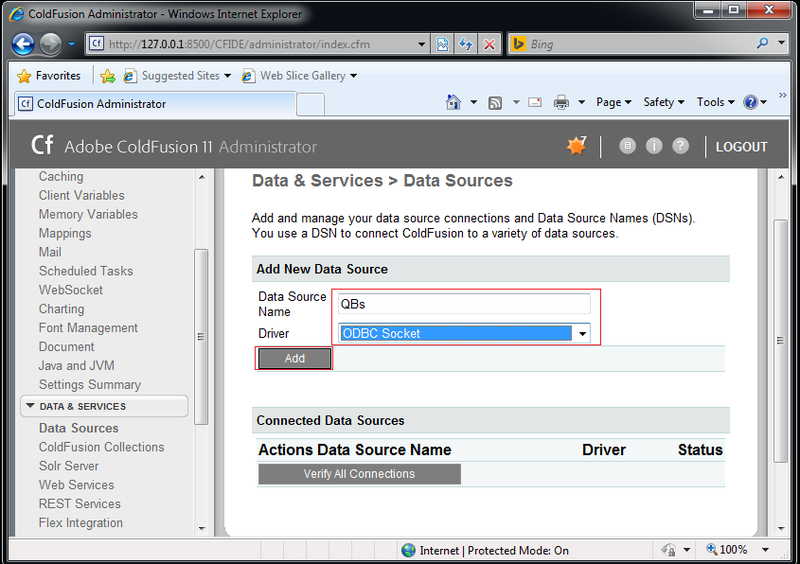 Using ColdFusion, whether it's an internal Intranet or on the World Wide Web, requires the Server Edition of QODBC. QuickBooks must be running with the company file opened on the system console. 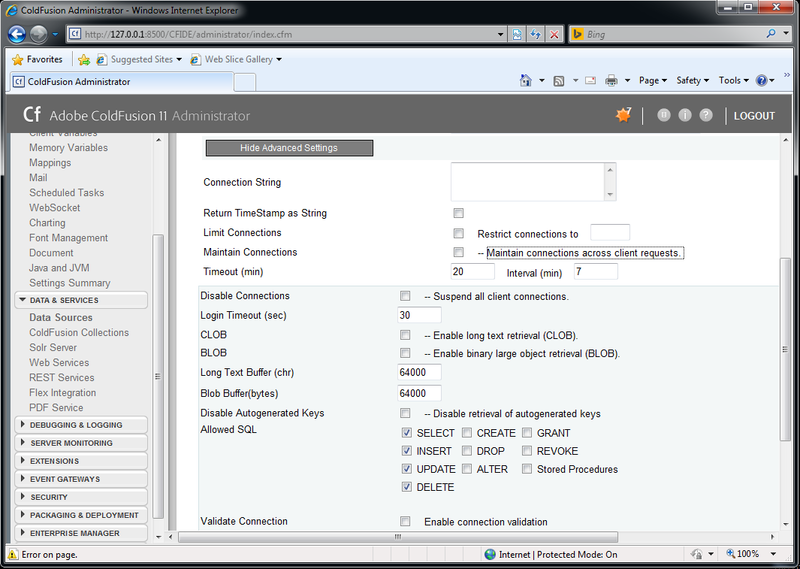 The first thing is to configure the QRemote Server. 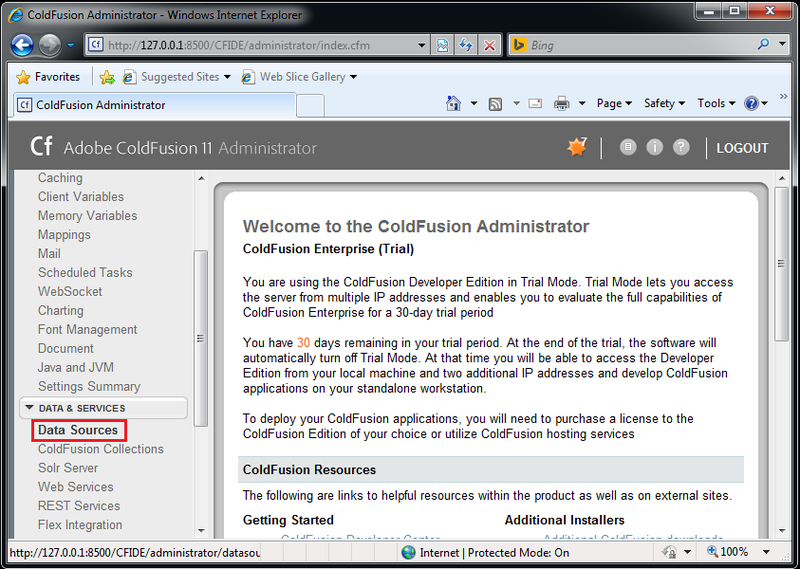 Run the ColdFusion Administrator. Enter your username & password & login. Under DATA & SERVICES choose Data Sources. Use "QBs" as the Data Source name if you want to match the DisplaySQL.cfm sample script below. The Driver is ODBC Socket. Press the Add button. 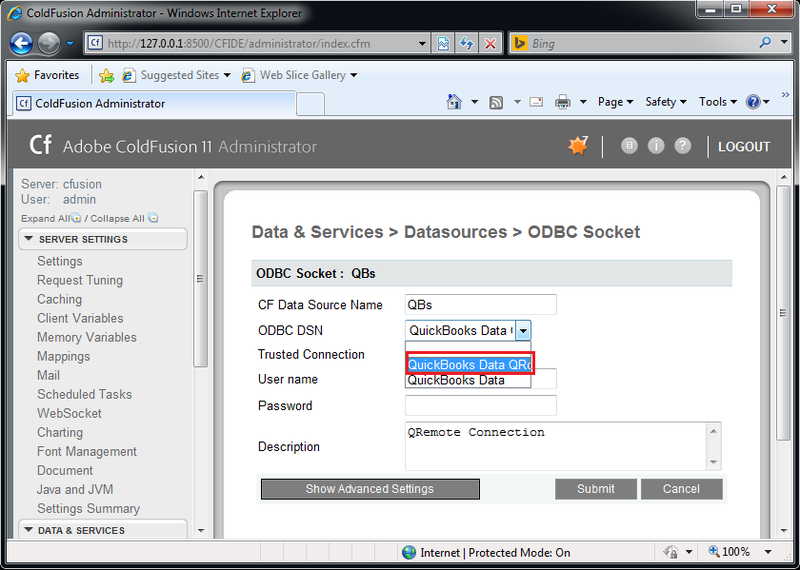 Under ODBC DSN choose a QuickBooks DSN. 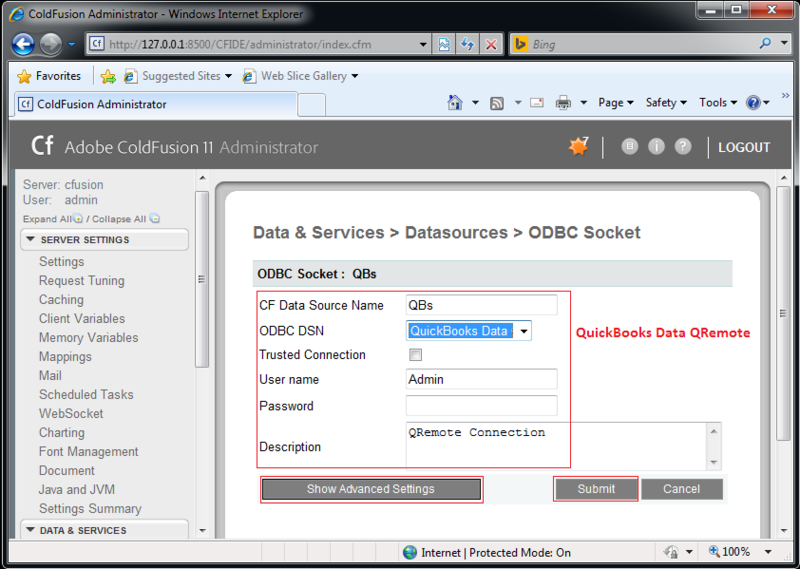 QuickBooks Data QRemote is a DSN that is created by the QODBC installation. Username should be set to Admin. You can put any notes you want in the description field. Next Press the Show Advanced Settings Button. Make sure the Limit Connections and Maintain Connections are unchecked. You can remove the checkboxes on Create, Drop, Alter, Grant and Revoke. Add checkboxes for Select, Insert, Update, Delete and Stored Procedures. 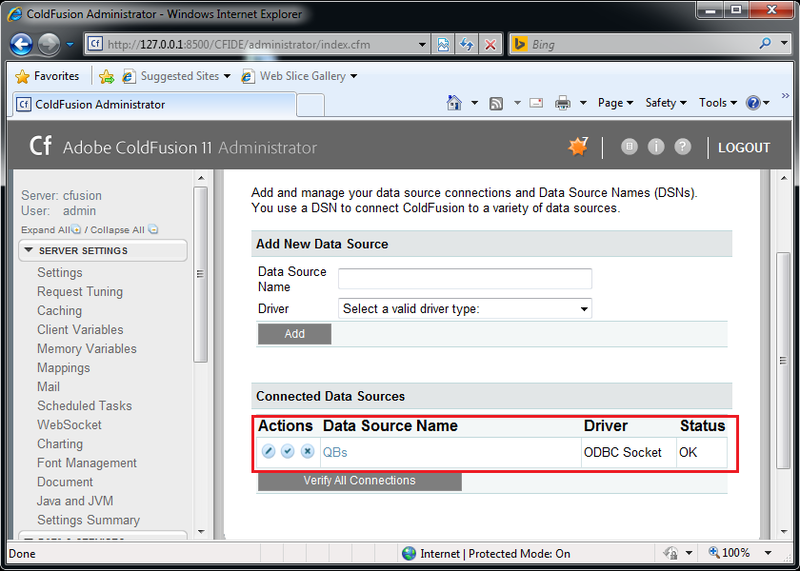 Press Submit and your QODBC Data Source should show on the list of Data Sources. 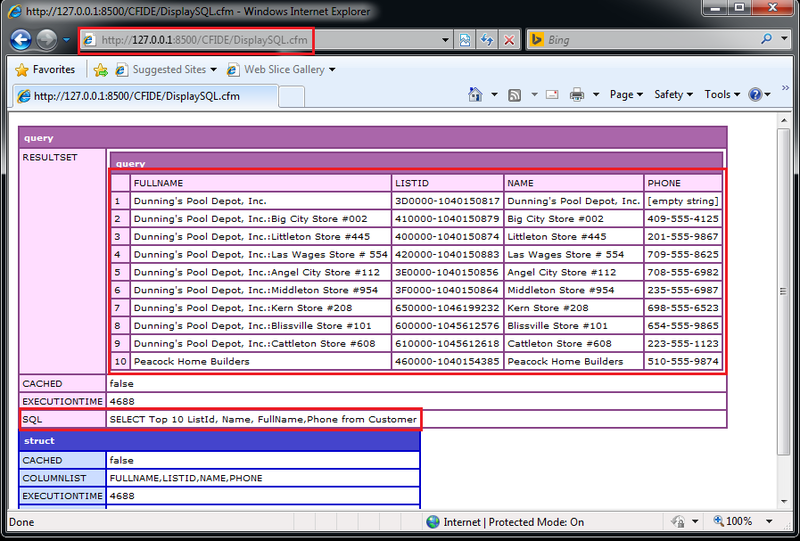 DisplaySQL.cfm uses dataSource="QBs" which is the QuickBooks Data QRemote DSN. To run this, Place this file under "CFIDE" & run through the browser. The query result is shown above. I am testing this on CF11 running on on Windows 10. 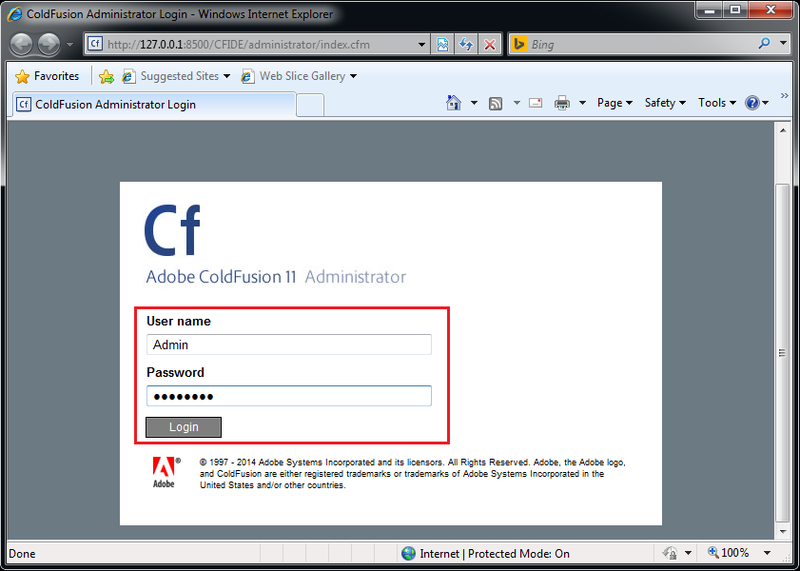 I think your ColdFusion is of 64-bit. If your ColdFusion is 64-bit, You need to use 64-bit QRemote DSN "QuickBooks Data 64-Bit QRemote" in your report & test again.